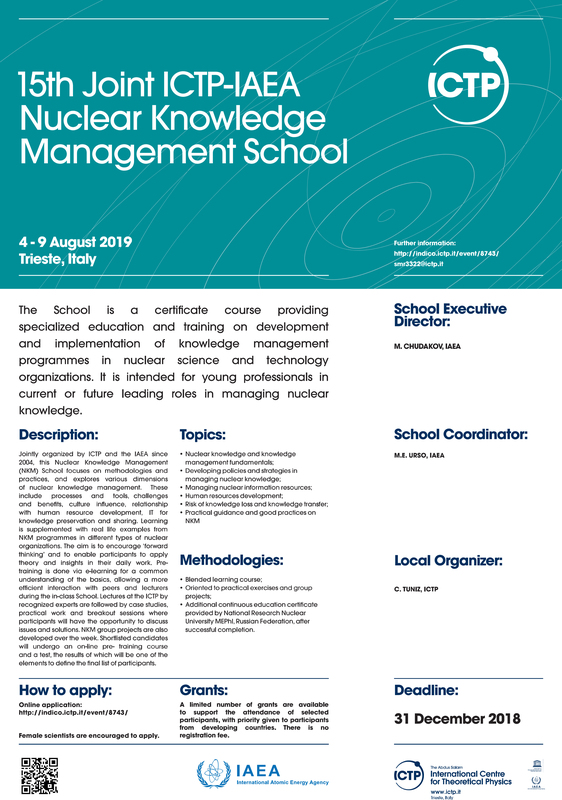 Jointly organized by ICTP and the IAEA since 2004, this Nuclear Knowledge management (NKM) School focuses on methodologies and practices, and explores various dimensions of nuclear processes and tools, challenges and benefits, culture influence, relationship with human resource preservation and sharing. Learning is supplemented with real life examples from NKM programmes in different types of nuclear organizations. The aim is to encourage ‘forward thinking’ and to enable participants to apply theory and insights in their daily work. Pre-training is done via e-learning for a common understanding of the basics, allowing a more efficient interaction with peers and lecturers during the in-class School. Lectures at the ICTP by recognized experts are followed by case studies, practical work and breakout sessions where participants will have the opportunity to discuss issues and solutions. NKM group projects are also developed over the week. Shortlisted candidates will undergo an on-line pre- training course and a test, the results of which will be one of the elements to define the final list of participants. Additional continuous education certificate provided by national Research Nuclear University MEPhI, Russian Federation, after successful completion.